Leaking Roof? Missing shingles? Don’t worry! Tin Man Sheet Metal & Roofing provides roofing repairs for commercial and residential throughout Houston, Galveston and surrounding areas. Since 1982, we have been a locally owned and operated business in Houston. We offer roofing repair, Standing Seam Metal Roofs, roof inspections and maintenance, shingle replacements, Seamless Aluminum Gutters, chimney caps, decorative chimney shrouds, and brick counter flashing. We are available for roofing installation on new construction projects. Our roofing experts are thoroughly trained in the most up-to-date roofing methods, products, and equipment. Whether you need gutters replaced, shingles repaired or custom copper installed you can count on us for all your roofing needs. As a local roofing company we understand the need to provide excellent customer service. We rely on our satisfied customers for referrals, so you can be sure you will always receive honest, dependable service. Our estimates are detailed and complete, so there are no surprises when the work is complete. 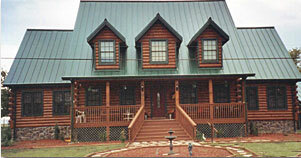 Tin Man Sheet Metal & Roofing is committed to providing the best products and workmanship. Call today for an estimate.